Should the seemingly inevitable happen and Burnley are relegated from the Premier League, Sean Dyche has the will to bounce back next season. The Clarets are eight points adrift of safety with nine available after the 1-0 defeat at West Ham on Saturday - a fourth-successive loss. Dyche admits Burnley are hoping for “myth, legend and folklore” to survive, but, asked whether he has the energy and desire to go again in the Championship, he said: “I’ve got no lack of energy. “I’m 43, I’ve got two kids, 10 and 12, trust me that’s enough to keep my energy levels high! 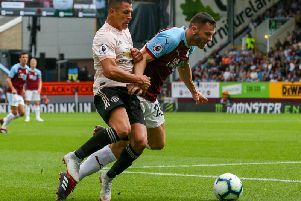 And he feels he and his players have given everything to try and prove the pundits wrong, who had the Clarets relegated as soon as they won promotion: “There are details within it, yes, I don’t mean generally, but there are obviously details within that. “Can we rinse another drop out of somebody, can we maximise another bit of potential that we see in people. “There’s always that, if you ever think you’ve got it made, then you are done, and I certainly don’t think I’ve got it made. I’m a young manager still learning but when you at the resources we’ve had available, then I think the staff, myself and the players have given a lot to the cause so for that, I’m not overthinking that. Burnley spent the least by a Premier League club since Blackpool in 2010/11, and Dyche doesn’t use that as an excuse: “Two and a half years ago the club was coming out of a couple of years earlier having Premier League money and all that it brings. “It does bring some challenges, they felt that they wanted to learn from that and move it forward in a different way. They were obviously aware, I made them aware, that this is a really tough challenge, to spend so little money and have such a low wage bill. Asked whether the club can learn from the experience, he added: “There’s a better model in place, there’s a new training ground facility on its way, there are new pitches on their way, the ground has improved for the fans, so there’s a better overall model in place, but it doesn’t take away the disappointment.